2008-03-05 Assigned to ACUSHNET COMPANY reassignment ACUSHNET COMPANY ASSIGNMENT OF ASSIGNORS INTEREST (SEE DOCUMENT FOR DETAILS). Assignors: SULLIVAN, MICHAEL J. A golf ball including a low compression core having an outer surface and a geometric center and being formed from a substantially homogenous composition throughout, the core having a diameter of 1.18 inches to 1.40 inches, an Atti compression of 42 or less, and a coefficient of restitution of 0.750 to 0.790. An outer cover having a thickness of 0.14 inches to 0.16 inches and a Shore D hardness of 60 to 70 is disposed about the core. The outer surface has a first hardness and the geometric center has a second hardness, the first hardness being substantially the same as or lower than the second hardness to define a “negative” hardness gradient. This application is a continuation-in-part of U.S. patent application Ser. No. 12/039,224, filed Feb. 28, 2008, which is a continuation-in-part of U.S. patent application Ser. No. 11/829,461, filed Jul. 27, 2007, which is a continuation-in-part of U.S. patent application Ser. No. 11/772,903, filed Jul. 3, 2007, and also a continuation-in-part of co-pending U.S. patent application Ser. No. 11/469,059, filed Aug. 31, 2006, which is a continuation of co-pending U.S. patent application Ser. No. 11/267,487, filed Nov. 4, 2005 and now U.S. Pat. No. 7,150,687, which is a continuation of co-pending U.S. patent application Ser. No. 10/841,031, filed May 7, 2004 and now U.S. Pat. No. 7,004,856. This invention relates generally to golf balls containing cores, more particularly single-layer cores, having a surface hardness equal to or less than the center hardness to define a “negative” hardness gradient across the core. Golf balls have been designed to provide particular playing characteristics. These characteristics generally include initial ball velocity, coefficient of restitution (COR), compression, weight distribution and spin of the golf ball, which can be optimized for various types of players. Generally, the hardness of a golf ball or a golf ball core is one of many factors used in designing golf balls. Typically, when a golf ball is hard, e.g., possessing a high compression value and low deformation, it typically has high COR and high initial velocity after impact with a golf club. However, a hard golf ball has a firm feel and can be difficult to control around the greens. A softer golf ball, e.g., having a lower compression value and high deformation, feels better and is easier to control with short iron clubs for greenside play. Recent advancements in golf ball design can produce golf balls with the combination of low compression for soft “feel” and high COR for long flight distance. The COR for low compression golf balls, however, decreases at higher impact speed with golf clubs. Solid golf balls are typically made with a solid core encased by a cover, both of which can have multiple layers, such as a dual core having a solid center and an outer core layer, or a multi-layer cover having an inner. Generally, golf ball cores and/or centers are constructed with a thermoset rubber, typically a polybutadiene-based composition. The cores are usually heated and crosslinked to create certain characteristics, such as higher or lower compression, which can impact the spin rate of the ball and/or provide better “feel.” These and other characteristics can be tailored to the needs of golfers of different abilities. From the perspective of a golf ball manufacturer, it is desirable to have cores exhibiting a wide range of properties, such as resilience, durability, spin, and “feel,” because this enables the manufacturer to make and sell many different types of golf balls suited to differing levels of ability. Heretofore, most single core golf ball cores have had a conventional hard-to-soft hardness gradient from the surface of the core to the center of the core, otherwise known as a “positive hardness gradient.” The patent literature contains a number of references that discuss a hard-surface-to-soft-center hardness gradient across a golf ball core. U.S. Pat. No. 4,650,193 to Molitor et al. generally discloses a hardness gradient in the surface layers of a core by surface treating a slug of curable elastomer with a cure-altering agent and subsequently molding the slug into a core. This treatment allegedly creates a core with two zones of different compositions, the first part being the hard, resilient, central portion of the core, which was left untreated, and the second being the soft, deformable, outer layer of the core, which was treated by the cure-altering agent. The two “layers” or regions of the core are integral with one another and, as a result, achieve the effect of a gradient of soft surface to hard center. U.S. Pat. No. 3,784,209 to Berman, et al. generally discloses a soft-to-hard hardness gradient. The '209 patent discloses a non-homogenous, molded golf ball with a core of “mixed” elastomers. A center sphere of uncured elastomeric material is surrounded by a compatible but different uncured elastomer. When both layers of elastomer are concurrently exposed to a curing agent, they become integral with one another, thereby forming a mixed core. The center of this core, having a higher concentration of the first elastomeric material, is harder than the outer layer. One drawback to this method of manufacture is the time-consuming process of creating first elastomer and then a second elastomer and then molding the two together. Other patents discuss cores that receive a surface treatment to provide a soft ‘skin’. However, since the interior portions of these cores are untreated, they have the similar hard surface to soft center gradient as conventional cores. For example, U.S. Pat. No. 6,113,831 to Nesbitt et al. generally discloses a conventional core and a separate soft skin wrapped around the core. This soft skin is created by exposing the preform slug to steam during the molding process so that a maximum mold temperature exceeds a steam set point, and by controlling exothermic molding temperatures during molding. The skin comprises the radially-outermost 1/32 inch to ¼ inch of the spherical core. U.S. Pat. Nos. 5,976,443 and 5,733,206, both to Nesbitt et al., disclose the addition of water mist to the outside surface of the slug before molding in order to create a soft skin. The water allegedly softens the compression of the core by retarding crosslinking on the core surface, thereby creating an even softer soft skin around the hard central portion. Additionally, a number of patents disclose multilayer golf ball cores, where each core layer has a different hardness thereby creating a hardness gradient from core layer to core layer. There remains a need, however, to achieve a single layer core that has a soft-to-hard gradient (a “negative” hardness gradient), from the surface towards the center, and to achieve a method of producing such a core that is inexpensive and efficient. A core exhibiting such characteristics would allow the golf ball designer to create products with unique combinations of compression, “feel,” and spin. The present invention is directed to a golf ball including a core having an outer surface and a geometric center. The core is preferably entirely formed from a substantially homogenous composition and has a diameter of 1.20 inches or less, a compression of 45 or less, and a coefficient of restitution of 0.780 or greater when measured at an incoming velocity of 125 ft/s. The core is typically covered with an outer cover layer having a thickness of 0.14 inches or greater and having a Shore D hardness of 60 to 70. The outer surface of the core is preferably substantially the same as or lower than the hardness of the geometric center of the core to define a “negative” hardness gradient. The homogeneous composition may also include a soft and fast agent. The hardness of the geometric center is typically about 0 Shore C to about 5 Shore C higher than the hardness of the outer surface of the core. Additionally, the core has a maximum hardness value and the hardness of the geometric center of the core has less than about 10 Shore C difference from the maximum hardness value, more preferably less than about 5 Shore C from the maximum hardness value. The present invention is also directed to a golf ball that includes a core that has a substantially homogenous composition throughout, an outer surface, and a geometric center. The core has an outer diameter of 1.40 inches or less, a compression of 60 or less, and a coefficient of restitution of 0.780 or greater when measured at an incoming velocity of 125 ft/s. The golf ball also has an outer cover around the core having a thickness of 0.101 inches to 0.25 inches. The geometric center of the core has a first hardness value, the outer surface of the core has a second hardness value, and the core has a maximum hardness value, such that the first hardness is substantially the same as or higher than the second hardness to define a “negative” hardness gradient, and has less than about 10 Shore C difference from the maximum hardness of the core. The present invention is further directed to a golf ball comprising a core having a substantially homogenous thermoset rubber composition throughout, an outer surface having a first hardness, and a center having a second hardness, the first hardness being substantially the same as or lower than the second hardness to define a negative hardness gradient; and an outer cover having a thickness of 0.1 inches or greater; wherein the core comprises a diene rubber composition, has an outer diameter of 1.40 inches or less, a compression of 70 or less, and a coefficient of restitution of 0.770 or greater when measured at an incoming velocity of 125 ft/s, and wherein the golf ball has a compression of 75 to 110 and a coefficient of restitution of 0.810 or greater when measured at an incoming velocity of 125 ft/s. The core has a diameter of 0.5 inches to 1.4 inches and a compression of 60 or less, more preferably 50 or less. The core has a maximum hardness value and the hardness of the center of the core is less than about 5 Shore C lower than the maximum hardness. The hardness of the center of the core is preferably about 0 Shore C to about 10 Shore C lower than the hardness of the core surface, more preferably about 0 Shore C to about 5 Shore C lower than the hardness of the core surface. The cover has a hardness of 70 Shore D or less and a thickness of 0.115 inches to 0.25 inches. The following terms that are used in this application are defined in terms of the enumerated ASTM tests: Specific Gravity ASTM D-792, Flexural Modulus ASTM D-790, Shore D Hardness ASTM D-2240, and Shore C Hardness ASTM D-2240. The ASTM D-792 test was carried out in lab conditions where the temperature was controlled to 20-23° C.
As used herein, the terms “points” and “compression points” refer to the compression scale or the compression scale based on the ATTI Engineering Compression Tester. This scale, which is well known to those working in this field, is used in determining the relative compression of a core or ball. Compression is measured by applying a spring-loaded force to the golf ball center, golf ball core or the golf ball to be examined, with a manual instrument (an “Atti gauge”) manufactured by the Atti Engineering Company of Union City, N.J. This machine, equipped with a Federal Dial Gauge, Model D81-C, employs a calibrated spring under a known load. The sphere to be tested is forced a distance of 0.2 inches (5 mm) against this spring. If the spring, in turn, compresses 0.2 inches, the compression is rated at 100; if the spring compresses 0.1 inches, the compression value is rated as 0. Thus more compressible, softer materials will have lower Atti gauge values than harder, less compressible materials. Compression measured with this instrument is also referred to as PGA compression. As used herein, “COR” refers to Coefficient of Restitution, which is obtained by dividing a ball's rebound velocity by its initial (i.e., incoming) velocity. This test is performed by firing the samples out of an air cannon at a vertical steel plate over a range of test velocities (from 75 to 150 ft/s). A golf ball having a high COR dissipates a smaller fraction of its total energy when colliding with the plate and rebounding therefrom than does a ball with a lower COR. Unless otherwise noted, the COR values reported herein are the values determined at an incoming velocity of 125 ft/s. As used herein, the term “copolymer” refers to a polymer which is formed from two or more monomers, wherein the monomers are not identical. As used herein, the term “terpolymer” refers to a polymer which is formed from three monomers, wherein the monomers are not identical. As used herein, the term “fillers” includes any compound or composition that can be used to vary the density and other properties of the subject golf ball cores. As used herein, the term “pph” in connection with a batch formulation refers to parts by weight of the constituent per hundred parts of the base composition (e.g., elastomer). As used herein, the term “Mooney viscosity” refers to the unit used to measure the plasticity of raw or unvulcanized rubber. The plasticity in a Mooney unit is equal to the torque, measured on an arbitrary scale, on a disk in a vessel that contains rubber at a temperature of 100° C. and rotates at two revolutions per minute. The measurement of Mooney viscosity is defined according to ASTM D-1646. The term “about,” as used herein in connection with one or more numbers or numerical ranges, should be understood to refer to all such numbers, including all numbers in a range. The balls of the present invention may include a single-layer (one-piece) golf ball, and multi-layer golf balls, such as one having a core and a cover surrounding the core, but are preferably formed from a core comprised of a solid center (otherwise known as an inner core) and an outer core layer, an inner cover layer and an outer cover layer. Of course, any of the core and/or the cover layers may include more than one layer. In a preferred embodiment, the core is formed of an inner core and an outer core layer where both the inner core and the outer core layer have a “soft-to-hard” hardness gradient (a “negative” hardness gradient) radially inward from each component's outer surface towards its innermost portion (i.e., the center of the inner core or the inner surface of the outer core layer), although alternative embodiments involving varying direction and combination of hardness gradient amongst core components are also envisioned (e.g., a “negative” gradient in the center coupled with a “positive” gradient in the outer core layer, or vice versa). The center of the core may also be a liquid-filled or hollow sphere surrounded by one or more intermediate and/or cover layers, or it may include a solid or liquid center around which tensioned elastomeric material is wound. Any layers disposed around these alternative centers may exhibit the inventive core hardness gradient (i.e., “negative”). The cover layer may be a single layer or, for example, formed of a plurality of layers, such as an inner cover layer and an outer cover layer. As briefly discussed above, the inventive cores may have a hardness gradient defined by hardness measurements made at the surface of the inner core (or outer core layer) and radially inward towards the center of the inner core, typically at 2-mm increments. As used herein, the terms “negative” and “positive” refer to the result of subtracting the hardness value at the innermost portion of the component being measured (e.g., the center of a solid core or an inner core in a dual core construction; the inner surface of a core layer; etc.) from the hardness value at the outer surface of the component being measured (e.g., the outer surface of a solid core; the outer surface of an inner core in a dual core; the outer surface of an outer core layer in a dual core, etc.). For example, if the outer surface of a solid core has a lower hardness value than the center (i.e., the surface is softer than the center), the hardness gradient will be deemed a “negative” gradient (a smaller number−a larger number=a negative number). It is preferred that the inventive cores have a zero or a negative hardness gradient, more preferably between zero (0) and −10, most preferably between 0 and −5. Preferably, the core layers (inner core or outer core layer) is made from a composition including at least one thermoset base rubber, such as a polybutadiene rubber, cured with at least one peroxide and at least one reactive co-agent, which can be a metal salt of an unsaturated carboxylic acid, such as acrylic acid or methacrylic acid, a non-metallic coagent, or mixtures thereof. Preferably, a suitable antioxidant is included in the composition. An optional soft and fast agent (and sometimes a cis-to-trans catalyst), such as an organosulfur or metal-containing organosulfur compound, can also be included in the core formulation. Other ingredients that are known to those skilled in the art may be used, and are understood to include, but not be limited to, density-adjusting fillers, process aides, plasticizers, blowing or foaming agents, sulfur accelerators, and/or non-peroxide radical sources. The base thermoset rubber, which can be blended with other rubbers and polymers, typically includes a natural or synthetic rubber. A preferred base rubber is 1,4-polybutadiene having a cis structure of at least 40%, preferably greater than 80%, and more preferably greater than 90%. Examples of desirable polybutadiene rubbers include BUNA® E CB22 and BUNA® CB23, commercially available from LANXESS Corporation; UBEPOL® 360L and UBEPOL® 150L and UBEPOL-BR rubbers, commercially available from UBE Industries, Ltd. of Tokyo, Japan; KINEX® 7245 and KINEX® 7265, commercially available from Goodyear of Akron, Ohio; SE BR-1220, and TAKTENE® 1203G1, 220, and 221, commercially available from Dow Chemical Company; Europrene® NEOCIS® BR 40 and BR 60, commercially available from Polimeri Europa; and BR 01, BR 730, BR 735, BR 11, and BR 51, commercially available from Japan Synthetic Rubber Co., Ltd; PETROFLEX® BRNd-40; and KARBOCHEM® ND40, ND45, and ND60, commercially available from Karbochem. The base rubber may also comprise high or medium Mooney viscosity rubber, or blends thereof. A “Mooney” unit is a unit used to measure the plasticity of raw or unvulcanized rubber. The plasticity in a “Mooney” unit is equal to the torque, measured on an arbitrary scale, on a disk in a vessel that contains rubber at a temperature of 100° C. and rotates at two revolutions per minute. The measurement of Mooney viscosity is defined according to ASTM D-1646. The Mooney viscosity range is preferably greater than about 40, more preferably in the range from about 40 to about 80 and more preferably in the range from about 40 to about 60. Polybutadiene rubber with higher Mooney viscosity may also be used, so long as the viscosity of the polybutadiene does not reach a level where the high viscosity polybutadiene clogs or otherwise adversely interferes with the manufacturing machinery. It is contemplated that polybutadiene with viscosity less than 65 Mooney can be used with the present invention. In one embodiment of the present invention, golf ball cores made with mid- to high-Mooney viscosity polybutadiene material exhibit increased resiliency (and, therefore, distance) without increasing the hardness of the ball. Such cores are soft, i.e., compression less than about 60 and more specifically in the range of about 50-55. Cores with compression in the range of from about 30 about 50 are also within the range of this preferred embodiment. Commercial sources of suitable mid- to high-Mooney viscosity polybutadiene include Bayer AG CB23 (Nd-catalyzed), which has a Mooney viscosity of around 50 and is a highly linear polybutadiene, and Shell 1220 (Co-catalyzed). If desired, the polybutadiene can also be mixed with other elastomers known in the art, such as other polybutadiene rubbers, natural rubber, styrene butadiene rubber, and/or isoprene rubber in order to further modify the properties of the core. When a mixture of elastomers is used, the amounts of other constituents in the core composition are typically based on 100 parts by weight of the total elastomer mixture. In one preferred embodiment, the base rubber comprises a Nd-catalyzed polybutadiene, a rare earth-catalyzed polybutadiene rubber, or blends thereof. If desired, the polybutadiene can also be mixed with other elastomers known in the art such as natural rubber, polyisoprene rubber and/or styrene-butadiene rubber in order to modify the properties of the core. Other suitable base rubbers include thermosetting materials such as, ethylene propylene diene monomer rubber, ethylene propylene rubber, butyl rubber, halobutyl rubber, hydrogenated nitrile butadiene rubber, nitrile rubber, and silicone rubber. Thermoplastic elastomers (TPE) many also be used to modify the properties of the core layers, or the uncured core layer stock by blending with the base thermoset rubber. These TPEs include natural or synthetic balata, or high trans-polyisoprene, high trans-polybutadiene, or any styrenic block copolymer, such as styrene ethylene butadiene styrene, styrene-isoprene-styrene, etc., a metallocene or other single-site catalyzed polyolefin such as ethylene-octene, or ethylene-butene, or thermoplastic polyurethanes (TPU), including copolymers, e.g. with silicone. Other suitable TPEs for blending with the thermoset rubbers of the present invention include PEBAX®, which is believed to comprise polyether amide copolymers, HYTREL®, which is believed to comprise polyether ester copolymers, thermoplastic urethane, and KRATON®, which is believed to comprise styrenic block copolymers elastomers. Any of the TPEs or TPUs above may also contain functionality suitable for grafting, including maleic acid or maleic anhydride. Additional polymers may also optionally be incorporated into the base rubber. Examples include, but are not limited to, thermoset elastomers such as core regrind, thermoplastic vulcanizate, copolymeric ionomer, terpolymeric ionomer, polycarbonate, polyamide, copolymeric polyamide, polyesters, polyvinyl alcohols, acrylonitrile-butadiene-styrene copolymers, polyarylate, polyacrylate, polyphenylene ether, impact-modified polyphenylene ether, high impact polystyrene, diallyl phthalate polymer, styrene-acrylonitrile polymer (SAN) (including olefin-modified SAN and acrylonitrile-styrene-acrylonitrile polymer), styrene-maleic anhydride copolymer, styrenic copolymer, functionalized styrenic copolymer, functionalized styrenic terpolymer, styrenic terpolymer, cellulose polymer, liquid crystal polymer, ethylene-vinyl acetate copolymers, polyurea, and polysiloxane or any metallocene-catalyzed polymers of these species. Suitable polyamides for use as an additional polymeric material in compositions within the scope of the present invention also include resins obtained by: (1) polycondensation of (a) a dicarboxylic acid, such as oxalic acid, adipic acid, sebacic acid, terephthalic acid, isophthalic acid, or 1,4-cyclohexanedicarboxylic acid, with (b) a diamine, such as ethylenediamine, tetramethylenediamine, pentamethylenediamine, hexamethylenediamine, or decamethylenediamine, 1,4-cyclohexanediamine, or m-xylylenediamine; (2) a ring-opening polymerization of cyclic lactam, such as ε-caprolactam or Ω-laurolactam; (3) polycondensation of an aminocarboxylic acid, such as 6-aminocaproic acid, 9-aminononanoic acid, 11-aminoundecanoic acid, or 12-aminododecanoic acid; or (4) copolymerization of a cyclic lactam with a dicarboxylic acid and a diamine. Specific examples of suitable polyamides include NYLON 6, NYLON 66, NYLON 610, NYLON 11, NYLON 12, copolymerized NYLON, NYLON MXD6, and NYLON 46. 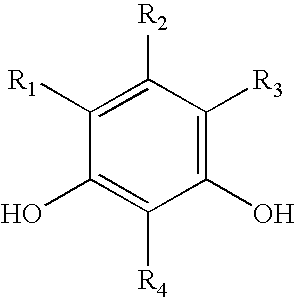 Suitable peroxide initiating agents include dicumyl peroxide; 2,5-dimethyl-2,5-di(t-butylperoxy) hexane; 2,5-dimethyl-2,5-di(t-butylperoxy)hexyne; 2,5-dimethyl-2,5-di(benzoylperoxy) hexane; 2,2′-bis(t-butylperoxy)-di-iso-propylbenzene; 1,1-bis(t-butylperoxy)-3,3,5-trimethyl cyclohexane; n-butyl 4,4-bis(t-butyl-peroxy)valerate; t-butyl perbenzoate; benzoyl peroxide; n-butyl 4,4′-bis(butylperoxy) valerate; di-t-butyl peroxide; or 2,5-di-(t-butylperoxy)-2,5-dimethyl hexane, lauryl peroxide, t-butyl hydroperoxide, α-α bis(t-butylperoxy) diisopropylbenzene, di(2-t-butyl-peroxyisopropyl)benzene, di-t-amyl peroxide, di-t-butyl peroxide. Preferably, the rubber composition includes from about 0.25 to about 5.0 parts by weight peroxide per 100 parts by weight rubber (phr), more preferably 0.5 phr to 3 phr, most preferably 0.5 phr to 1.5 phr. In a most preferred embodiment, the peroxide is present in an amount of about 0.8 phr. These ranges of peroxide are given assuming the peroxide is 100% active, without accounting for any carrier that might be present. Because many commercially available peroxides are sold along with a carrier compound, the actual amount of active peroxide present must be calculated. Commercially-available peroxide initiating agents include DICUP™ family of dicumyl peroxides (including DICUP™ R, DICUP™ 40C and DICUP™ 40KE) available from Crompton (Geo Specialty Chemicals). Similar initiating agents are available from AkroChem, Lanxess, Flexsys/Harwick and R. T. Vanderbilt. Another commercially-available and preferred initiating agent is TRIGONOX™ 265-50B from Akzo Nobel, which is a mixture of 1,1-di(t-butylperoxy)-3,3,5-trimethylcyclohexane and di(2-t-butylperoxyisopropyl) benzene. TRIGONOX™ peroxides are generally sold on a carrier compound. Suitable reactive co-agents include, but are not limited to, metal salts of diacrylates, dimethacrylates, and monomethacrylates suitable for use in this invention include those wherein the metal is zinc, magnesium, calcium, barium, tin, aluminum, lithium, sodium, potassium, iron, zirconium, and bismuth. Zinc diacrylate (ZDA) is preferred, but the present invention is not limited thereto. ZDA provides golf balls with a high initial velocity. The ZDA can be of various grades of purity. For the purposes of this invention, the lower the quantity of zinc stearate present in the ZDA the higher the ZDA purity. ZDA containing less than about 10% zinc stearate is preferable. More preferable is ZDA containing about 4-8% zinc stearate. Suitable, commercially available zinc diacrylates include those from Sartomer Co. The preferred concentrations of ZDA that can be used are about 10 phr to about 40 phr, more preferably 20 phr to about 35 phr, most preferably 25 phr to about 35 phr. In a particularly preferred embodiment, the reactive co-agent is present in an amount of about 29 phr to about 31 phr. Additional preferred co-agents that may be used alone or in combination with those mentioned above include, but are not limited to, trimethylolpropane trimethacrylate, trimethylolpropane triacrylate, and the like. It is understood by those skilled in the art, that in the case where these co-agents may be liquids at room temperature, it may be advantageous to disperse these compounds on a suitable carrier to promote ease of incorporation in the rubber mixture. Antioxidants are compounds that inhibit or prevent the oxidative breakdown of elastomers, and/or inhibit or prevent reactions that are promoted by oxygen radicals. Some exemplary antioxidants that may be used in the present invention include, but are not limited to, quinoline type antioxidants, amine type antioxidants, and phenolic type antioxidants. A preferred antioxidant is 2,2′-methylene-bis-(4-methyl-6-t-butylphenol) available as VANOX® MBPC from R. T. Vanderbilt. Other polyphenolic antioxidants include VANOX® T, VANOX® L, VANOX® SKT, VANOX® SWP, VANOX® 13 and VANOX® 1290. Suitable antioxidants include, but are not limited to, alkylene-bis-alkyl substituted cresols, such as 4,4′-methylene-bis(2,5-xylenol); 4,4′-ethylidene-bis-(6-ethyl-m-cresol); 4,4′-butylidene-bis-(6-t-butyl-m-cresol); 4,4′-decylidene-bis-(6-methyl-m-cresol); 4,4′-methylene-bis-(2-amyl-m-cresol); 4,4′-propylidene-bis-(5-hexyl-m-cresol); 3,3′-decylidene-bis-(5-ethyl-p-cresol); 2,2′-butylidene-bis-(3-n-hexyl-p-cresol); 4,4′-(2-butylidene)-bis-(6-t-butyl-m-cresol); 3,3′-4(decylidene)-bis-(5-ethyl-p-cresol); (2,5-dimethyl-4-hydroxyphenyl) (2-hydroxy-3,5-dimethylphenyl) methane; (2-methyl-4-hydroxy-5-ethylphenyl) (2-ethyl-3-hydroxy-5-methylphenyl) methane; (3-methyl-5-hydroxy-6-t-butylphenyl) (2-hydroxy-4-methyl-5-decylphenyl)-n-butyl methane; (2-hydroxy-4-ethyl-5-methylphenyl) (2-decyl-3-hydroxy-4-methylphenyl)butylamylmethane; (3-ethyl-4-methyl-5-hydroxyphenyl)-(2,3-dimethyl-3-hydroxy-phenyl)nonylmethane; (3-methyl-2-hydroxy-6-ethylphenyl)-(2-isopropyl-3-hydroxy-5-methyl-phenyl)cyclohexylmethane; (2-methyl-4-hydroxy-5-methylphenyl) (2-hydroxy-3-methyl-5-ethylphenyl)dicyclohexyl methane; and the like. Other suitable antioxidants include, but are not limited to, substituted phenols, such as 2-tert-butyl-4-methoxyphenol; 3-tert-butyl-4-methoxyphenol; 3-tert-octyl-4-methoxyphenol; 2-methyl-4-methoxyphenol; 2-stearyl-4-n-butoxyphenol; 3-t-butyl-4-stearyloxyphenol; 3-lauryl-4-ethoxyphenol; 2,5-di-t-butyl-4-methoxyphenol; 2-methyl-4-methoxyphenol; 2-(1-methycyclohexyl)-4-methoxyphenol; 2-t-butyl-4-dodecyloxyphenol; 2-(1-methylbenzyl)-4-methoxyphenol; 2-t-octyl-4-methoxyphenol; methyl gallate; n-propyl gallate; n-butyl gallate; lauryl gallate; myristyl gallate; stearyl gallate; 2,4,5-trihydroxyacetophenone; 2,4,5-trihydroxy-n-butyrophenone; 2,4,5-trihydroxystearophenone; 2,6-ditert-butyl-4-methylphenol; 2,6-ditert-octyl-4-methylphenol; 2,6-ditert-butyl-4-stearylphenol; 2-methyl-4-methyl-6-tert-butylphenol; 2,6-distearyl-4-methylphenol; 2,6-dilauryl-4-methylphenol; 2,6-di(n-octyl)-4-methylphenol; 2,6-di(n-hexadecyl)-4-methylphenol; 2,6-di(1-methylundecyl)-4-methylphenol; 2,6-di(1-methylheptadecyl)-4-methylphenol; 2,6-di(trimethylhexyl)-4-methylphenol; 2,6-di(1,1,3,3-tetramethyloctyl)-4-methylphenol; 2-n-dodecyl-6-tert butyl-4-methylphenol; 2-n-dodecyl-6-(1-methylundecyl)-4-methylphenol; 2-n-dodecyl-6-(1,1,3,3-tetramethyloctyl)-4-methylphenol; 2-n-dodecyl-6-n-octadecyl-4-methylphenol; 2-n-dodecyl-6-n-octyl-4-methylphenol; 2-methyl-6-n-octadecyl-4-methylphenol; 2-n-dodecyl-6-(1-methylheptadecyl)-4-methylphenol; 2,6-di(1-methylbenzyl)-4-methylphenol; 2,6-di(1-methylcyclohexyl)-4-methylphenol; 2,6-(1-methylcyclohexyl)-4-methylphenol; 2-(1-methylbenzyl)-4-methylphenol; and related substituted phenols. More suitable antioxidants include, but are not limited to, alkylene bisphenols, such as 4,4′-butylidene bis(3-methyl-6-t-butyl phenol); 2,2-butylidene bis (4,6-dimethyl phenol); 2,2′-butylidene bis(4-methyl-6-t-butyl phenol); 2,2′-butylidene bis(4-t-butyl-6-methyl phenol); 2,2′-ethylidene bis(4-methyl-6-t-butylphenol); 2,2′-methylene bis(4,6-dimethyl phenol); 2,2′-methylene bis(4-methyl-6-t-butyl phenol); 2,2′-methylene bis(4-ethyl-6-t-butyl phenol); 4,4′-methylene bis(2,6-di-t-butyl phenol); 4,4′-methylene bis(2-methyl-6-t-butyl phenol); 4,4′-methylene bis(2,6-dimethyl phenol); 2,2′-methylene bis(4-t-butyl-6-phenyl phenol); 2,2′-dihydroxy-3,3′,5,5′-tetramethylstilbene; 2,2′-isopropylidene bis(4-methyl-6-t-butyl phenol); ethylene bis (beta-naphthol); 1,5-dihydroxy naphthalene; 2,2′-ethylene bis (4-methyl-6-propyl phenol); 4,4′-methylene bis(2-propyl-6-t-butyl phenol); 4,4′-ethylene bis (2-methyl-6-propyl phenol); 2,2′-methylene bis(5-methyl-6-t-butyl phenol); and 4,4′-butylidene bis(6-t-butyl-3-methyl phenol). Suitable antioxidants further include, but are not limited to, alkylene trisphenols, such as 2,6-bis (2′-hydroxy-3′-t-butyl-5′-methyl benzyl)-4-methyl phenol; 2,6-bis (2′-hydroxy-3′-t-ethyl-5′-butyl benzyl)-4-methyl phenol; and 2,6-bis(2′-hydroxy-3′-t-butyl-5′-propyl benzyl)-4-methyl phenol. The antioxidant is typically present in an amount of about 0.1 phr to about 5 phr, preferably from about 0.1 phr to about 2 phr, more preferably about 0.1 phr to about 1 phr. In a particularly preferred embodiment, the antioxidant is present in an amount of about 0.4 phr. In an alternative embodiment, the antioxidant should be present in an amount to ensure that the hardness gradient of the inventive cores is negative. Preferably, about 0.2 phr to about 1 phr antioxidant is added to the core layer (inner core or outer core layer) formulation, more preferably, about 0.3 to about 0.8 phr, and most preferably 0.4 to about 0.7 phr. Preferably, about 0.25 phr to about 1.5 phr of peroxide as calculated at 100% active can be added to the core formulation, more preferably about 0.5 phr to about 1.2 phr, and most preferably about 0.7 phr to about 1.0 phr. The ZDA amount can be varied to suit the desired compression, spin and feel of the resulting golf ball. The cure regime can have a temperature range between from about 290° F. to about 335° F., more preferably about 300° F. to about 325° F., and the stock is held at that temperature for at least about 10 minutes to about 30 minutes. The thermoset rubber composition of the present invention may also include an optional soft and fast agent. As used herein, “soft and fast agent” means any compound or a blend thereof that that is capable of making a core 1) be softer (lower compression) at constant COR or 2) have a higher COR at equal compression, or any combination thereof, when compared to a core equivalently prepared without a soft and fast agent. Preferably, the composition of the present invention contains from about 0.05 phr to about 10.0 phr soft and fast agent. In one embodiment, the soft and fast agent is present in an amount of about 0.05 phr to about 3.0 phr, preferably about 0.05 phr to about 2.0 phr, more preferably about 0.05 phr to about 1.0 phr. In another embodiment, the soft and fast agent is present in an amount of about 2.0 phr to about 5.0 phr, preferably about 2.35 phr to about 4.0 phr, and more preferably about 2.35 phr to about 3.0 phr. In an alternative high concentration embodiment, the soft and fast agent is present in an amount of about 5.0 phr to about 10.0 phr, more preferably about 6.0 phr to about 9.0 phr, most preferably about 7.0 phr to about 8.0 phr. In a most preferred embodiment, the soft and fast agent is present in an amount of about 2.6 phr. Suitable soft and fast agents include, but are not limited to, organosulfur or metal-containing organosulfur compounds, an organic sulfur compound, including mono, di, and polysulfides, a thiol, or mercapto compound, an inorganic sulfide compound, a Group VIA compound, or mixtures thereof. The soft and fast agent component may also be a blend of an organosulfur compound and an inorganic sulfide compound. where R1-R5 can be C1-C8 alkyl groups; halogen groups; thiol groups (—SH), carboxylated groups; sulfonated groups; and hydrogen; in any order; and also pentafluorothiophenol; 2-fluorothiophenol; 3-fluorothiophenol; 4-fluorothiophenol; 2,3-fluorothiophenol; 2,4-fluorothiophenol; 3,4-fluorothiophenol; 3,5-fluorothiophenol 2,3,4-fluorothiophenol; 3,4,5-fluorothiophenol; 2,3,4,5-tetrafluorothiophenol; 2,3,5,6-tetrafluorothiophenol; 4-chlorotetrafluorothiophenol; pentachlorothiophenol; 2-chlorothiophenol; 3-chlorothiophenol; 4-chlorothiophenol; 2,3-chlorothiophenol; 2,4-chlorothiophenol; 3,4-chlorothiophenol; 3,5-chlorothiophenol; 2,3,4-chlorothiophenol; 3,4,5-chlorothiophenol; 2,3,4,5-tetrachlorothiophenol; 2,3,5,6-tetrachlorothiophenol; pentabromothiophenol; 2-bromothiophenol; 3-bromothiophenol; 4-bromothiophenol; 2,3-bromothiophenol; 2,4-bromothiophenol; 3,4-bromothiophenol; 3,5-bromothiophenol; 2,3,4-bromothiophenol; 3,4,5-bromothiophenol; 2,3,4,5-tetrabromothiophenol; 2,3,5,6-tetrabromothiophenol; pentaiodothiophenol; 2-iodothiophenol; 3-iodothiophenol; 4-iodothiophenol; 2,3-iodothiophenol; 2,4-iodothiophenol; 3,4-iodothiophenol; 3,5-iodothiophenol; 2,3,4-iodothiophenol; 3,4,5-iodothiophenol; 2,3,4,5-tetraiodothiophenol; 2,3,5,6-tetraiodothiophenoland; and their zinc salts. Preferably, the halogenated thiophenol compound is pentachlorothiophenol, which is commercially available in neat form or under the tradename STRUKTOL®, a clay-based carrier containing the sulfur compound pentachlorothiophenol loaded at 45 percent (correlating to 2.4 parts PCTP). STRUKTOL® is commercially available from Struktol Company of America of Stow, Ohio. PCTP is commercially available in neat form from eChinachem of San Francisco, Calif. and in the salt form from eChinachem of San Francisco, Calif. 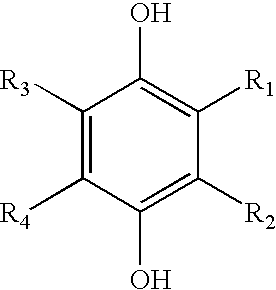 Most preferably, the halogenated thiophenol compound is the zinc salt of pentachlorothiophenol, which is commercially available from eChinachem of San Francisco, Calif.
As used herein when referring to the invention, the term “organosulfur compound(s)” refers to any compound containing carbon, hydrogen, and sulfur, where the sulfur is directly bonded to at least 1 carbon. As used herein, the term “sulfur compound” means a compound that is elemental sulfur, polymeric sulfur, or a combination thereof. It should be further understood that the term “elemental sulfur” refers to the ring structure of S8 and that “polymeric sulfur” is a structure including at least one additional sulfur relative to elemental sulfur. Additional suitable examples of soft and fast agents (that are also believed to be cis-to-trans catalysts) include, but are not limited to, 4,4′-diphenyl disulfide; 4,4′-ditolyl disulfide; 2,2′-benzamido diphenyl disulfide; bis(2-aminophenyl) disulfide; bis(4-aminophenyl) disulfide; bis(3-aminophenyl) disulfide; 2,2′-bis(4-aminonaphthyl) disulfide; 2,2′-bis(3-aminonaphthyl) disulfide; 2,2′-bis(4-aminonaphthyl) disulfide; 2,2′-bis(5-aminonaphthyl) disulfide; 2,2′-bis(6-aminonaphthyl) disulfide; 2,2′-bis(7-aminonaphthyl) disulfide; 2,2′-bis(8-aminonaphthyl) disulfide; 1,1′-bis(2-aminonaphthyl) disulfide; 1,1′-bis(3-aminonaphthyl) disulfide; 1,1′-bis(3-aminonaphthyl) disulfide; 1,1′-bis(4-aminonaphthyl) disulfide; 1,1′-bis(5-aminonaphthyl) disulfide; 1,1′-bis(6-aminonaphthyl) disulfide; 1,1′-bis(7-aminonaphthyl) disulfide; 1,1′-bis(8-aminonaphthyl) disulfide; 1,2′-diamino- 1,2′-dithiodinaphthalene; 2,3′-diamino-1,2′-dithiodinaphthalene; bis(4-chlorophenyl) disulfide; bis(2-chlorophenyl) disulfide; bis(3-chlorophenyl) disulfide; bis(4-bromophenyl) disulfide; bis(2-bromophenyl) disulfide; bis(3-bromophenyl) disulfide; bis(4-fluorophenyl) disulfide; bis(4-iodophenyl) disulfide; bis(2,5-dichlorophenyl) disulfide; bis(3,5-dichlorophenyl) disulfide; bis (2,4-dichlorophenyl) disulfide; bis(2,6-dichlorophenyl) disulfide; bis(2,5-dibromophenyl) disulfide; bis(3,5-dibromophenyl) disulfide; bis(2-chloro-5-bromophenyl) disulfide; bis(2,4,6-trichlorophenyl) disulfide; bis(2,3,4,5,6-pentachlorophenyl) disulfide; bis(4-cyanophenyl) disulfide; bis(2-cyanophenyl) disulfide; bis(4-nitrophenyl) disulfide; bis(2-nitrophenyl) disulfide; 2,2′-dithiobenzoic acid ethylester; 2,2′-dithiobenzoic acid methylester; 2,2′-dithiobenzoic acid; 4,4′-dithiobenzoic acid ethylester; bis(4-acetylphenyl) disulfide; bis(2-acetylphenyl) disulfide; bis(4-formylphenyl) disulfide; bis(4-carbamoylphenyl) disulfide; 1,1′-dinaphthyl disulfide; 2,2′-dinaphthyl disulfide; 1,2′-dinaphthyl disulfide; 2,2′-bis(l -chlorodinaphthyl) disulfide; 2,2′-bis(1-bromonaphthyl) disulfide; 1,1′-bis(2-chloronaphthyl) disulfide; 2,2′-bis(1-cyanonaphthyl) disulfide; 2,2′-bis(1-acetylnaphthyl) disulfide; and the like; or a mixture thereof. Preferred organosulfur components include 4,4′-diphenyl disulfide, 4,4′-ditolyl disulfide, or 2,2′-benzamido diphenyl disulfide, or a mixture thereof. A more preferred organosulfur component includes 4,4′-ditolyl disulfide. In another embodiment, metal-containing organosulfur components can be used according to the invention. Suitable metal-containing organosulfur components include, but are not limited to, cadmium, copper, lead, and tellurium analogs of diethyldithiocarbamate, diamyldithiocarbamate, and dimethyldithiocarbamate, or mixtures thereof. Suitable substituted or unsubstituted aromatic organic components that do not include sulfur or a metal include, but are not limited to, 4,4′-diphenyl acetylene, azobenzene, or a mixture thereof. 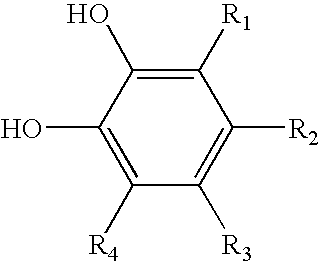 The aromatic organic group preferably ranges in size from C6 to C20, and more preferably from C6 to C10. Suitable inorganic sulfide components include, but are not limited to titanium sulfide, manganese sulfide, and sulfide analogs of iron, calcium, cobalt, molybdenum, tungsten, copper, selenium, yttrium, zinc, tin, and bismuth. A substituted or unsubstituted aromatic organic compound is also suitable as a soft and fast agent. 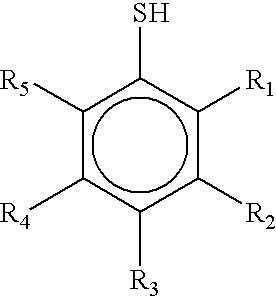 Suitable substituted or unsubstituted aromatic organic components include, but are not limited to, components having the formula (R1)x-R3-M-R4-(R2)y, wherein R1 and R2 are each hydrogen or a substituted or unsubstituted C1-20 linear, branched, or cyclic alkyl, alkoxy, or alkylthio group, or a single, multiple, or fused ring C6 to C24 aromatic group; x and y are each an integer from 0 to 5; R3 and R4 are each selected from a single, multiple, or fused ring C6 to C24 aromatic group; and M includes an azo group or a metal component. R3 and R4 are each preferably selected from a C6 to C1o aromatic group, more preferably selected from phenyl, benzyl, naphthyl, benzamido, and benzothiazyl. R1 and R2 are each preferably selected from a substituted or unsubstituted C1-10 linear, branched, or cyclic alkyl, alkoxy, or alkylthio group or a C6 to C1O aromatic group. When R1, R2, R3, or R4, are substituted, the substitution may include one or more of the following substituent groups: hydroxy and metal salts thereof; mercapto and metal salts thereof; halogen; amino, nitro, cyano, and amido; carboxyl including esters, acids, and metal salts thereof, silyl; acrylates and metal salts thereof; sulfonyl or sulfonamide; and phosphates and phosphites. When M is a metal component, it may be any suitable elemental metal available to those of ordinary skill in the art. Typically, the metal will be a transition metal, although preferably it is tellurium or selenium. In one embodiment, the aromatic organic compound is substantially free of metal, while in another embodiment the aromatic organic compound is completely free of metal. The soft and fast agent can also include a Group VIA component. Elemental sulfur and polymeric sulfur are commercially available from Elastochem, Inc. of Chardon, Ohio. Exemplary sulfur catalyst compounds include PB(RM-S)-80 elemental sulfur and PB(CRST)-65 polymeric sulfur, each of which is available from Elastochem, Inc. An exemplary tellurium catalyst under the tradename TELLOY® and an exemplary selenium catalyst under the tradename VANDEX® are each commercially available from RT Vanderbilt. Other suitable soft and fast agents include, but are not limited to, hydroquinones, benzoquinones, quinhydrones, catechols, and resorcinols. wherein each R1, R2, R3, and R4 are hydrogen; halogen; alkyl; carboxyl; metal salts thereof, and esters thereof, acetate and esters thereof; formyl; acyl; acetyl; halogenated carbonyl; sulfo and esters thereof; halogenated sulfonyl; sulfino; alkylsulfinyl; carbamoyl; halogenated alkyl; cyano; alkoxy; hydroxy and metal salts thereof; amino; nitro; aryl; aryloxy; arylalkyl; nitroso; acetamido; or vinyl. Other suitable hydroquinone compounds include, but are not limited to, hydroquionone; tetrachlorohydroquinone; 2-chlorohydroquionone; 2-bromohydroquinone; 2,5-dichlorohydroquinone; 2,5-dibromohydroquinone; tetrabromohydroquinone; 2-methylhydroquinone; 2-t-butylhydroquinone; 2,5-di-t-amylhydroquinone; and 2-(2-chlorophenyl) hydroquinone hydrate. wherein each R1, R2, R3, and R4 are a metal salt of a carboxyl; acetate and esters thereof, hydroxy; a metal salt of a hydroxy; amino; nitro; aryl; aryloxy; arylalkyl; nitroso; acetamido; or vinyl. wherein each R1, R2, R3, and R4 are hydrogen; halogen; alkyl; carboxyl; metal salts thereof, and esters thereof; acetate and esters thereof; formyl; acyl; acetyl; halogenated carbonyl; sulfo and esters thereof; halogenated sulfonyl; sulfino; alkylsulfinyl; carbamoyl; halogenated alkyl; cyano; alkoxy; hydroxy and metal salts thereof, amino; nitro; aryl; aryloxy; arylalkyl; nitroso; acetamido; or vinyl. wherein each R1, R2, R3, R4, R5, R6, R7, and R8 are hydrogen; halogen; alkyl; carboxyl; metal salts thereof, and esters thereof; acetate and esters thereof; formyl; acyl; acetyl; halogenated carbonyl; sulfo and esters thereof; halogenated sulfonyl; sulfino; alkylsulfinyl; carbamoyl; halogenated alkyl; cyano; alkoxy; hydroxy and metal salts thereof; amino; nitro; aryl; aryloxy; arylalkyl; nitroso; acetamido; or vinyl. Other suitable quinhydrones include those having the above formula, wherein each R1, R2, R3, R4, R5, R6, R7, and R8 are a metal salt of a carboxyl; acetate and esters thereof; hydroxy; a metal salt of a hydroxy; amino; nitro; aryl; aryloxy; arylalkyl; nitroso; acetamido; or vinyl. wherein each R1, R2, R3, and R4 are hydrogen; halogen; alkyl; carboxyl; metal salts thereof, and esters thereof; acetate and esters thereof; formyl; acyl; acetyl; halogenated carbonyl; sulfo and esters thereof; halogenated sulfonyl; sulfino; alkylsulfinyl; carbamoyl; halogenated alkyl; cyano; alkoxy; hydroxy and metal salts thereof; amino; nitro; aryl; aryloxy; arylalkyl; nitroso; acetamido; or vinyl. Fillers may also be added to the thermoset rubber composition of the core to adjust the density of the composition, up or down. Typically, fillers include materials such as tungsten, zinc oxide, barium sulfate, silica, calcium carbonate, zinc carbonate, metals, metal oxides and salts, regrind (recycled core material typically ground to about 30 mesh particle), high-Mooney-viscosity rubber regrind, trans-regrind core material (recycled core material containing high trans-isomer of polybutadiene), and the like. When trans-regrind is present, the amount of trans-isomer is preferably between about 10% and about 60%. In a preferred embodiment of the invention, the core comprises polybutadiene having a cis-isomer content of greater than about 95% and trans-regrind core material (already vulcanized) as a filler. Any particle size trans-regrind core material is sufficient, but is preferably less than about 125 μm. Fillers added to one or more portions of the golf ball typically include processing aids or compounds to affect rheological and mixing properties, density-modifying fillers, tear strength, or reinforcement fillers, and the like. The fillers are generally inorganic, and suitable fillers include numerous metals or metal oxides, such as zinc oxide and tin oxide, as well as barium sulfate, zinc sulfate, calcium carbonate, barium carbonate, clay, tungsten, tungsten carbide, an array of silicas, and mixtures thereof. Fillers may also include various foaming agents or blowing agents which may be readily selected by one of ordinary skill in the art. Fillers may include polymeric, ceramic, metal, and glass microspheres may be solid or hollow, and filled or unfilled. Fillers are typically also added to one or more portions of the golf ball to modify the density thereof to conform to uniform golf ball standards. Fillers may also be used to modify the weight of the center or at least one additional layer for specialty balls, e.g., a lower weight ball is preferred for a player having a low swing speed. Materials such as tungsten, zinc oxide, barium sulfate, silica, calcium carbonate, zinc carbonate, metals, metal oxides and salts, and regrind (recycled core material typically ground to about 30 mesh particle) are also suitable fillers. The polybutadiene and/or any other base rubber or elastomer system may also be foamed, or filled with hollow microspheres or with expandable microspheres which expand at a set temperature during the curing process to any low specific gravity level. Other ingredients such as sulfur accelerators, e.g., tetra methylthiuram di, tri, or tetrasulfide, and/or metal-containing organosulfur components may also be used according to the invention. Suitable metal-containing containing organosulfur accelerators include, but are not limited to, cadmium, copper, lead, and tellurium analogs of diethyldithiocarbamate, diamyldithiocarbamate, and dimethyldithiocarbamate, or mixtures thereof. Other ingredients such as processing aids e.g., fatty acids and/or their metal salts, processing oils, dyes and pigments, as well as other additives known to one skilled in the art may also be used in the present invention in amounts sufficient to achieve the purpose for which they are typically used. A number of cores were formed based on the formulation and cure cycle described in TABLE I below and core hardness values are reported in TABLE II below. The surface hardness of a core is obtained from the average of a number of measurements taken from opposing hemispheres of a core, taking care to avoid making measurements on the parting line of the core or on surface defects, such as holes or protrusions. Hardness measurements are made pursuant to ASTM D-2240 “Indentation Hardness of Rubber and Plastic by Means of a Durometer.” Because of the curved surface of a core, care must be taken to insure that the core is centered under the durometer indentor before a surface hardness reading is obtained. A calibrated, digital durometer, capable of reading to 0.1 hardness units is used for all hardness measurements and is set to take hardness readings at 1 second after the maximum reading is obtained. The digital durometer must be attached to, and its foot made parallel to, the base of an automatic stand, such that the weight on the durometer and attack rate conform to ASTM D-2240. To prepare a core for hardness gradient measurements, the core is gently pressed into a hemispherical holder having an internal diameter approximately slightly smaller than the diameter of the core, such that the core is held in place in the hemispherical portion of the holder while concurrently leaving the geometric central plane of the core exposed. The core is secured in the holder by friction, such that it will not move during the cutting and grinding steps, but the friction is not so excessive that distortion of the natural shape of the core would result. The core is secured such that the parting line of the core is roughly parallel to the top of the holder. The diameter of the core is measured 90 degrees to this orientation prior to securing. A measurement is also made from the bottom of the holder to the top of the core to provide a reference point for future calculations. A rough cut, made slightly above the exposed geometric center of the core using a band saw or other appropriate cutting tool, making sure that the core does not move in the holder during this step. The remainder of the core, still in the holder, is secured to the base plate of a surface grinding machine. The exposed ‘rough’ core surface is ground to a smooth, flat surface, revealing the geometric center of the core, which can be verified by measuring the height of the bottom of the holder to the exposed surface of the core, making sure that exactly half of the original height of the core, as measured above, has been removed to within ±0.004 inches. Leaving the core in the holder, the center of the core is found with a center square and carefully marked and the hardness is measured at the center mark. Hardness measurements at any distance from the center of the core may be measured by drawing a line radially outward from the center mark, and measuring and marking the distance from the center, typically in 2-mm increments. All hardness measurements performed on the plane passing through the geometric center are performed while the core is still in the holder and without having disturbed its orientation, such that the test surface is constantly parallel to the bottom of the holder. The hardness difference from any predetermined location on the core is calculated as the average surface hardness minus the hardness at the appropriate reference point, e.g., at the center of the core for single, solid core, such that a core surface softer than its center will have a negative hardness gradient. Referring to TABLES I and II, in Example 1, the surface is 10 Shore C points lower than the center hardness and 12 Shore C points lower than the hardest point in the core. In Example 3, the surface is 5 Shore C points lower than the center hardness and 8 Shore C points lower than the hardest point in the core. In Example 2, the center and surface hardness values are equal and the softest point in the core is 10 Shore C points lower than the surface. In the examples of the invention presented in TABLE I, the cure temperatures are varied from 305° F. to 320° F. and cure times are varied from 11 to 16 minutes. The core compositions of examples 1 and 2 are identical, and only the cure cycle is changed. In example 3 the amount of antioxidant is identical to examples 1 and 2, but other ingredients are varied as well the cure cycle. Additionally, the ratio of antioxidant to initiator varies from 0.50 to 0.57 from example 1 and 2 to example 3. The ratio of antioxidant to initiator is one factor to control the surface hardness of the cores. The data shown in TABLE II shows that hardness gradient is at least, but not limited to, a function of the amount of antioxidant and peroxide, their ratio, and the cure cycle. It should be noted that higher antioxidant also requires higher peroxide initiator to maintain the desired compression. The core of Comparative Example 1, whose composition is shown in TABLE I was cured using a conventional cure cycle, with a cure temperature of 350° F. and a cure time of 11 minutes. The inventive cores were produced using cure cycles of 305° F. for 14 minutes, 315° F. for 11 minutes and 320° F. for 16 minutes. The hardness gradients of these cores were measured and the following observations can be made. For the cores of the Comparative Examples, as expected, a conventional hard surface to soft center gradient can be clearly seen. The gradients for inventive cores follow substantially the same shape as one another. In all preferred embodiments of invention, the hardness of the core at the surface is at most about the same as or substantially less than the hardness of the core at the center. Furthermore, the center hardness of the core may not be the hardest point in the core, but in all cases, it is preferred that it is at least equal to or harder than the surface. Additionally, the lowest hardness anywhere in the core does not have to occur at the surface. In some embodiments, the lowest hardness value occurs within about the outer 6 mm of the core surface. However, the lowest hardness value within the core can occur at any point from the surface, up to, but not including the center, as long as the surface hardness is still equal to, or less than the hardness of the center. It should be noted that in the present invention the formulation is the same throughout the core, or core layer, and no surface treatment is applied to the core to obtain the preferred surface hardness. In accordance with another embodiment of the present invention, a golf ball is provided with a very low compression core and a thick cover layer. Preferably, the core for the low compression embodiment has an Atti compression of 30 or less, more preferably 20 or less, most preferably 10 or less. While a conventional core (i.e., one having a “positive” hardness gradient) would be sufficient for the low compression core embodiment, preferably the core has a zero or, most preferably, a “negative” hardness gradient. In this embodiment, the core preferably has an outer diameter of 1.10 inches to 1.50 inches, more preferably 1.18 inches to 1.40 inches, and most preferably 1.20 inches to 1.36 inches. With a very low compression core, it is preferred that the cover layer comprise as resilient polymeric material, such as “high acid” ionomers having greater than about 16% by weight acid, such as those disclosed in U.S. Pat. No. 6,774,189 which is incorporated herein by reference. The preferred cover layers have a thickness of 0.101 inches to 0.250 inches, more preferably 0.125 inches to 0.200 inches, and most preferably 0.14 inches to 0.16 inches. In a preferred low compression embodiment, the core has a “negative” gradient, a compression of 42 or less, and a COR of 0.750 to 0.790. The compression is more preferably about 30 or less. The surface of the core has a hardness of about 60 Shore C or less, more preferably about 58 Shore C or less, most preferably about 55 Shore C or less—correspondingly, the geometric center of the core has a hardness greater than the core surface (to define the “negative” hardness gradient) and about 61 Shore C or less, more preferably about 59 Shore C or less, most preferably about 56 Shore C or less. Soft, highly resilient ionomers, are suitable for the cores and layers of the present invention and are preferably formed from the full neutralization of the acid copolymer(s) of at least one E/X/Y copolymer, where E is ethylene, X is the α,β-ethylenically unsaturated carboxylic acid, and Y is a softening co-monomer. X is preferably present in 2-30 (preferably 4-20, most preferably 5-15) wt. % of the polymer, and Y is preferably present in 17-40 (preferably 20-40, and more preferably 24-35) wt. % of the polymer. Preferably, the melt index (MI) of the base resin is at least 20, or at least 40, more preferably, at least 75 and most preferably at least 150. Particular soft, resilient ionomers included in this invention are partially neutralized ethylene/(meth) acrylic acid/butyl (meth)acrylate copolymers having an MI and level of neutralization that results in a melt processible polymer that has useful physical properties. The copolymers are at least partially neutralized. Preferably at least 40, or, more preferably at least 55, even more preferably about 70, and most preferably about 80 of the acid moiety of the acid copolymer is neutralized by one or more alkali metal, transition metal, or alkaline earth metal cations. Cations useful in making the ionomers of this invention comprise lithium, sodium, potassium, magnesium, calcium, barium, or zinc, or a combination of such cations. The invention also relates to a “modified” soft, resilient thermoplastic ionomer that comprises a melt blend of (a) the acid copolymers or the melt processiible ionomers made therefrom as described above and (b) one or more organic acid(s) or salt(s) thereof, wherein greater than 80%, preferably greater than 90% of all the acid of (a) and of (b) is neutralized. Preferably, 100% of all the acid of (a) and (b) is neutralized by a cation source. Preferably, an amount of cation source in excess of the amount required to neutralize 100% of the acid in (a) and (b) is used to neutralize the acid in (a) and (b). Blends with fatty acids or fatty acid salts are preferred. The organic acids or salts thereof are added in an amount sufficient to enhance the resilience of the copolymer. Preferably, the organic acids or salts thereof are added in an amount sufficient to substantially remove remaining ethylene crystallinity of the copolymer. Preferably, the organic acids or salts are added in an amount of at least about 5% (weight basis) of the total amount of copolymer and organic acid(s). More preferably, the organic acids or salts thereof are added in an amount of at least about 15%, even more preferably at least about 20%. Preferably, the organic acid(s) are added in an amount up to about 50% (weight basis) based on the total amount of copolymer and organic acid. More preferably, the organic acids or salts thereof are added in an amount of up to about 40%, more preferably, up to about 35%. The non-volatile, non-migratory organic acids preferably are one or more aliphatic, mono-functional organic acids or salts thereof as described below, particularly one or more aliphatic, mono-functional, saturated or unsaturated organic acids having less than 36 carbon atoms or salts of the organic acids, preferably stearic acid or oleic acid. Fatty acids or fatty acid salts are most preferred. (b) Adding a sufficient amount of a cation source to increase the level of neutralization of all the acid moieties (including those in the acid copolymer and in the organic acid if the non-volatile, non-migratory organic acid is an organic acid) to the desired level. The weight ratio of X to Y in the composition is at least about 1:20. Preferably, the weight ratio of X to Y is at least about 1:15, more preferably, at least about 1:10. Furthermore, the weight ratio of X to Y is up to about 1:1.67, more preferably up to about 1:2. Most preferably, the weight ratio of X to Y in the composition is up to about 1:2.2. The acid copolymers used in the present invention to make the ionomers are preferably ‘direct’ acid copolymers (containing high levels of softening monomers). As noted above, the copolymers are at least partially neutralized, preferably at least about 40% of X in the composition is neutralized. More preferably, at least about 55% of X is neutralized. Even more preferably, at least about 70, and most preferably, at least about 80% of X is neutralized. In the event that the copolymer is highly neutralized (e.g., to at least 45%, preferably 50%, 55%, 70%, or 80%, of acid moiety), the MI of the acid copolymer should be sufficiently high so that the resulting neutralized resin has a measurable MI in accord with ASTM D-1238, condition E, at 190° C., using a 2160 gram weight. Preferably this resulting MI will be at least 0.1, preferably at least 0.5, and more preferably 1.0 or greater. Preferably, for highly neutralized acid copolymer, the MI of the acid copolymer base resin is at least 20, or at least 40, at least 75, and more preferably at least 150. The acid copolymers preferably comprise alpha olefin, particularly ethylene, C3-8. α,β-ethylenically unsaturated carboxylic acid, particularly acrylic and methacrylic acid, and softening monomers, selected from alkyl acrylate, and alkyl methacrylate, wherein the alkyl groups have from 1-8 carbon atoms, copolymers. By “softening,” it is meant that the crystallinity is disrupted (the polymer is made less crystalline). While the alpha olefin can be a C2-C4 alpha olefin, ethylene is most preferred for use in the present invention. Accordingly, it is described and illustrated herein in terms of ethylene as the alpha olefin. The acid copolymers, when the alpha olefin is ethylene, can be described as E/X/Y copolymers where E is ethylene, X is the α,β-ethylenically unsaturated carboxylic acid, and Y is a softening co-monomer X is preferably present in 2-30 (preferably 4-20, most preferably 5-15) wt. % of the polymer, and Y is preferably present in 17-40 (preferably 20-40, most preferably 24-35) wt. % of the polymer. The ethylene-acid copolymers with high levels of acid (X) are difficult to prepare in continuous polymerizers because of monomer-polymer phase separation. This difficulty can be avoided however by use of “co-solvent technology” as described in U.S. Pat. No. 5,028,674, or by employing somewhat higher pressures than those which copolymers with lower acid can be prepared. Specific acid-copolymers include ethylene/(meth)acrylic acid/n-butyl (meth)acrylate, ethylene/(meth)acrylic acid/iso-butyl(meth)acrylate, ethylene/(meth)acrylic acid/methyl (meth)acrylate, and ethylene/(meth)acrylic acid/ethyl(meth)acrylate terpolymers. The organic acids employed are aliphatic, mono-functional (saturated, unsaturated, or multi-unsaturated) organic acids, particularly those having fewer than 36 carbon atoms. Also salts of these organic acids may be employed. Fatty acids or fatty acid salts are preferred. The salts may be any of a wide variety, particularly including the barium, lithium, sodium, zinc, bismuth, potassium, strontium, magnesium or calcium salts of the organic acids. Particular organic acids useful in the present invention include caproic acid, caprylic acid, capric acid, lauric acid, stearic acid, behenic acid, erucic acid, oleic acid, and linoleic acid. The optional filler component is chosen to impart additional density to blends of the previously described components, the selection being dependent upon the different parts (e.g., cover, mantle, core, center, intermediate layers in a multilayered core or ball) and the type of golf ball desired (e.g., one-piece, two-piece, three-piece or multiple-piece ball), as will be more fully detailed below. Generally, the filler will be inorganic having a density greater than about 4 grams/cubic centimeter (g/cm3), preferably greater than 5 g/cm3, and will be present in amounts between 0 to about 60 wt. % based on the total weight of the composition. Examples of useful fillers include zinc oxide, barium sulfate, lead silicate and tungsten carbide, as well as the other well-known fillers used in golf balls. It is preferred that the filler materials be non-reactive or almost non-reactive and not stiffen or raise the compression nor reduce the coefficient of restitution significantly. Additional optional additives useful in the practice of the subject invention include acid copolymer wax (e.g., Allied wax AC 143 believed to be an ethylene/16-18% acrylic acid copolymer with a number average molecular weight of 2,040), which assist in preventing reaction between the filler materials (e.g., ZnO) and the acid moiety in the ethylene copolymer. Other optional additives include TiO2, which is used as a whitening agent; optical brighteners; surfactants; processing aids; etc. Ionomers may be blended with conventional ionomeric copolymers (di-, ter-, etc.) , using well-known techniques, to manipulate product properties as desired. The blends would still exhibit lower hardness and higher resilience when compared with blends based on conventional ionomers. Also, ionomers can be blended with non-ionic thermoplastic resins to manipulate product properties. The non-ionic thermoplastic resins would, by way of non-limiting illustrative examples, include thermoplastic elastomers, such as polyurethane, poly-ether-ester, poly-amide-ether, polyether-urea, PEBAX(® (a family of block copolymers based on polyether-block-amide, commercially supplied by Atochem), styrene-butadiene-styrene (SBS) block copolymers, styrene(ethylene-butylene)-styrene block copolymers, etc., poly amide (oligomeric and polymeric), polyesters, polyolefins including PE, PP, E/P copolymers, etc., ethylene copolymers with various comonomers, such as vinyl acetate, (meth)acrylates, (meth)acrylic acid, epoxy-functionalized monomer, CO, etc., functionalized polymers with maleic anhydride grafting, epoxidization etc., elastomers, such as EPDM, metallocene catalyzed PE and copolymer, ground up powders of the thermoset elastomers, etc. Such thermoplastic blends comprise about 1% to about 99% by weight of a first thermoplastic and about 99% to about 1% by weight of a second thermoplastic. Additionally, the compositions of U.S. Pat. Nos. 6,953,820 and 6,653,382, both of which are incorporated herein in their entirety, discuss compositions having high COR when formed into solid spheres. The thermoplastic composition of this invention comprises a polymer which, when formed into a sphere that is 1.50 to 1.54 inches in diameter, has a coefficient of restitution (COR) when measured by firing the sphere at an initial velocity of 125 ft/s against a steel plate positioned 3 feet from the point where initial velocity and rebound velocity are determined and by dividing the rebound velocity from the plate by the initial velocity and an Atti compression of no more than 100. The thermoplastic composition of this invention preferably comprises (a) aliphatic, mono-functional organic acid(s) having fewer than 36 carbon atoms; and (b) ethylene, C3 to C8 α,β-ethylenically unsaturated carboxylic acid copolymer(s) and ionomer(s) thereof, wherein greater than 90%, preferably near 100%, and more preferably 100% of all the acid of (a) and (b) are neutralized. The thermoplastic composition preferably comprises melt-processible, highly-neutralized (greater than 90%, preferably near 100%, and more preferably 100%) polymer of (1) ethylene, C3 to C8 α,β-ethylenically unsaturated carboxylic acid copolymers that have their crystallinity disrupted by addition of a softening monomer or other means such as high acid levels, and (2) non-volatile, non-migratory agents such as organic acids (or salts) selected for their ability to substantially or totally suppress any remaining ethylene crystallinity. Agents other than organic acids (or salts) may be used. It has been found that, by modifying an acid copolymer or ionomer with a sufficient amount of specific organic acids (or salts thereof); it is possible to highly neutralize the acid copolymer without losing processibility or properties such as elongation and toughness. The organic acids employed in the present invention are aliphatic, mono-functional, saturated or unsaturated organic acids, particularly those having fewer than 36 carbon atoms, and particularly those that are non-volatile and non-migratory and exhibit ionic array plasticizing and ethylene crystallinity suppression properties. With the addition of sufficient organic acid, greater than 90%, nearly 100%, and preferably 100% of the acid moieties in the acid copolymer from which the ionomer is made can be neutralized without losing the processibility and properties of elongation and toughness. (a) melt-blending (1) ethylene α,β-ethylenically unsaturated C3-8 carboxylic acid copolymer(s) or melt-processible ionomer(s) thereof (ionomers that are not neutralized to the level that they have become intractable, that is not melt-processible) with (1) one or more aliphatic, mono-functional, saturated or unsaturated organic acids having fewer than 36 carbon atoms or salts of the organic acids, and then concurrently or subsequently (b) adding a sufficient amount of a cation source to increase the level of neutralization all the acid moieties (including those in the acid copolymer and in the organic acid) to greater than 90%, preferably near 100%, more preferably to 100%. (b) adding a sufficient amount of a cation source to increase the level of neutralization all the acid moieties (including those in the acid copolymer and in the organic acid if the non-volatile, non-migratory agent is an organic acid) to greater than 90%, preferably near 100%, more preferably to 100%. The acid copolymers used in the present invention to make the ionomers are preferably ‘direct’ acid copolymers. They are preferably alpha olefin, particularly ethylene, C3-8 α,β-ethylenically unsaturated carboxylic acid, particularly acrylic and methacrylic acid, copolymers. They may optionally contain a third softening monomer. By “softening,” it is meant that the crystallinity is disrupted (the polymer is made less crystalline). Suitable “softening” co-monomers are monomers selected from alkyl acrylate, and alkyl methacrylate, wherein the alkyl groups have from 1-8 carbon atoms. The acid copolymers, when the alpha olefin is ethylene, can be described as E/X/Y copolymers where E is ethylene, X is the α,β-ethylenically unsaturated carboxylic acid, and Y is a softening comonomer. X is preferably present in 3-30 (preferably 4-25, most preferably 5-20) wt. % of the polymer, and Y is preferably present in 0-30 (alternatively 3-25 or 10-23) wt. % of the polymer. Spheres were prepared using fully neutralized ionomers A and B as presented in TABLE III. *indicates that cation was sufficient to neutralize 105% of all the acid in the resin and the organic acid. These compositions were molded into 1.53-inch spheres for which data is presented in the following table. Further testing of commercially available highly neutralized polymers HNP1 and HNP2 had the following properties. These materials are exemplary examples of the preferred center and/or core layer compositions of the present invention. They may also be used as a cover layer herein. Golf balls made with such cores enjoy high COR at relatively low club speeds. The COR of these balls is higher than the COR of similar balls with higher compression cores at relatively low club speeds. At higher club speeds, however, the COR of golf balls with low compression cores can be lower than the COR of balls with higher compression cores. As illustrated herein, a first golf ball with a 1.505-inch core and a core compression of 48 (hereinafter “Sample-48”) and a second golf ball with a 1.515-inch core and a core compression of 80 (hereinafter “Sample-80”) were subject to the following distance and COR tests. Sample-48 and Sample-80 have essentially the same size core and similar dual-layer cover. The single most significant difference between these two balls is the compression of the respective cores. As used in the ball speed test, the “average driver set-up” refers to a set of launch conditions, i.e., at a club head speed to which a mechanical golf club has been adjusted so as to generate a ball speed of about 140 ft/s. Similarly, the “standard driver set-up” refers to similar ball speed at launch conditions of about 160 ft/s; the “Pro 167 set-up” refers to a ball speed at launch conditions of about 167 ft/s; and the “Big Pro 175 set-up” refers to a ball speed at launch conditions of about 175 ft/s. Also, as used in the COR test, the mass plate is a 45-kilogram plate (100 lbs) against which the balls strike at the indicated speed. The 200-gram solid plate is a smaller mass that the balls strike and resembles the mass of a club head. The 199.8-gram calibration plate resembles a driver with a flexible face that has a COR of 0.830. The ball speed test results show that while Sample-48 holds a ball speed advantage at club speeds of 140 ft/s to 160 ft/s launch conditions, Sample-80 decidedly has better ball speed at 167 ft/s and 175 ft/s launch conditions. Similarly, the COR test results show that at the higher collision speed (160 ft/s), the COR generally goes down for both balls, but the 199.8-gram calibration test shows that the COR of the higher compression Sample-80 is significantly better than the lower compression Sample-48 at the collision speed (160 ft/s). Additionally, while the COR generally goes down for both balls, the rate of decrease is much less for Sample-80 than for Sample-48. Unless specifically noted, COR values used hereafter are measured by either the mass plate method or the 200-gram solid plate method, i.e., where the impact plate is not flexible. Unless otherwise noted, COR values used hereafter are measured by either the mass plate method or the 200-gram solid plate method. The intermediate layers of the present invention may, optionally, comprise a durable, low deformation material such as metal, rigid plastics, or polymers re-enforced with high strength organic or inorganic fillers or fibers, or blends or composites thereof, as discussed below. Suitable plastics or polymers include, but not limited to, high cis- or trans-polybutadiene, one or more of partially or fully neutralized ionomers including those neutralized by a metal ion source wherein the metal ion is the salt of an organic acid, polyolefins including polyethylene, polypropylene, polybutylene and copolymers thereof including polyethylene acrylic acid or methacrylic acid copolymers, or a terpolymer of ethylene, a softening acrylate class ester such as methyl acrylate, n-butyl-acrylate or iso-butyl-acrylate, and a carboxylic acid such as acrylic acid or methacrylic acid (e.g., terpolymers including polyethylene-methacrylic acid-n or iso-butyl acrylate and polyethylene-acrylic acid-methyl acrylate, polyethylene ethyl or methyl acrylate, polyethylene vinyl acetate, polyethylene glycidyl alkyl acrylates). Suitable polymers also include metallocene catalyzed polyolefins, polyesters, polyamides, non-ionomeric thermoplastic elastomers, copolyether-esters, copolyether-amides, EPR, EPDM, thermoplastic or thermosetting polyurethanes, polyureas, polyurethane ionomers, epoxies, polycarbonates, polybutadiene, polyisoprene, and blends thereof. In the case of metallocenes, the polymer may be cross-linked with a free radical source, such as peroxide, or by high radiation. Preferably, when the intermediate layer is made with polybutadiene or other synthetic and natural rubber, the rubber composition is highly cross-linked with at least 50 phr of a suitable co-reaction agent, which includes a metal salt of diacrylate, dimethacrylate or mono methacrylate. Preferably, the co-reaction agent is zinc diacrylate. If desired, the golf ball can include highly rigid materials, such as certain metals, which include, but are not limited to, tungsten, steel, titanium, chromium, nickel, copper, aluminum, zinc, magnesium, lead, tin, iron, molybdenum and alloys thereof. Suitable highly rigid materials include those listed in U.S. Pat. No. 6,244,977, which is incorporated by reference. Fillers with very high specific gravity, such as those disclosed in U.S. Pat. No. 6,287,217, which is incorporated by reference, can also be incorporated into the inner core. Suitable fillers and composites include, but not limited to, carbon including graphite, glass, aramid, polyester, polyethylene, polypropylene, silicon carbide, boron carbide, natural or synthetic silk. In accordance to one embodiment of the present invention, the golf ball comprises at least two core layers, an innermost core and an outer core, and a cover. Preferably, outer core comprises a flexible, low compression, high COR rubber composition discussed above, and inner core comprises a low deformation material discussed above. The hard, low deformation inner core resists deformation at high club speeds to maintain the COR at an optimal level, while the resilient outer layer provides high COR at slower club speeds and the requisite softness for short iron club play. The inventive ball, therefore, enjoys high initial velocity and high COR at high and low club head speeds associated, while maintaining a desirable soft feel and soft sound for greenside play. Other rubber compounds for outer core may also include any low compression, highly resilient polymers comprising natural rubbers, including cis-polyisoprene, trans-polyisoprene or balata, synthetic rubbers including 1,2-polybutadiene, cis-polybutadiene, trans-polybutadiene, polychloroprene, poly(norbornene), polyoctenamer and polypentenamer among other diene polymers. Outer core may comprise a plurality of layers, e.g., a laminate, where several thin flexible layers are plied or otherwise adhered together. Preferably, the rigid inner core, if present, has a flexural modulus in the range of about 25,000 psi to about 250,000 psi. More preferably, the flexural modulus of the rigid inner core is in the range of about 75,000 psi to about 225,000 psi, and most preferably in the range of about 80,000 psi to about 200,000 psi. Furthermore, the rigid inner core has durometer hardness in the range of greater than about 70 on the Shore C scale. The compression of the rigid inner core is preferably in the range of greater than about 60 PGA or Atti. More preferably, the compression is greater than about 70, and most preferably greater than about 80. Shore hardness is measured according to ASTM D-2240-00, and flexural modulus is measured in accordance to ASTM D6272-98 about two weeks after the test specimen are prepared. Preferably, the outer core is softer and has a lower compression than the inner core. Preferably, outer core has a flexural modulus of about 500 psi to about 25,000 psi. More preferably, the flexural modulus is less than about 15,000 psi. The outer core preferably has a hardness of about 25 to about 70 on the Shore C scale. More preferably, the hardness is less than 60 on the Shore C scale. One preferred way to achieve the difference in hardness between the inner core and the outer core is to make the inner core from un-foamed polymer, and to make the outer core from foamed polymer selected from the suitable materials disclosed herein. Alternatively, the outer core may be made from these suitable materials having their specific gravity reduced. In this embodiment the inner and outer core can be made from the same polymer or polymeric composition. Preferably, outer core layer has a thickness from about 0.001 inches to about 0.100 inches, preferably from bout 0.010 inches to about 0.050 inches and more preferably from about 0.015 inches to about 0.035 inches. Preferably, the overall core diameter is greater than about 1.50 inches, preferably greater than about 1.580 inches, and more preferably greater than about 1.60 inches. The inner core may have any dimension so long as the overall core diameter has the preferred dimensions listed above. The cover should be tough, cut-resistant, and selected from conventional materials used as golf ball covers based on the desired performance characteristics. The cover may be comprised of one or more layers. Cover materials such as ionomer resins, blends of ionomer resins, thermoplastic or thermoset urethane, and balata, can be used as known in the art. The cover is preferably a resilient, non-reduced specific gravity layer. Suitable materials include any material that allows for tailoring of ball compression, coefficient of restitution, spin rate, etc. and are disclosed in U.S. Pat. Nos. 6,419,535; 6,152,834; 5,919,100; and 5,885,172, which is incorporated by reference. Ionomers, ionomer blends, thermosetting or thermoplastic polyurethanes, metallocenes, polyurethanes, polyureas (and hybrids thereof), are the preferred materials. The cover can be manufactured by a casting method, reaction injection molded, injected or compression molded, sprayed or dipped method. Preferably the cover is cast about the core. In a preferred embodiment, the golf ball includes an intermediate layer, as either an outer core layer or an inner cover, in addition to the outer cover. As disclosed in the U.S. Pat. Nos. 5,885,172 and 6,132,324, which are incorporated herein by reference in their entireties, outer cover layer is made from a soft thermoset material, such as cast polyurethane or polyurea, and inner cover is made from an ionomeric material, preferably including at least two ionomers. When the intermediate layer is an inner cover layer, it is preferably formed from a high flexural modulus material which contributes to the low spin, distance characteristics of the presently claimed balls when they are struck for long shots (e.g. driver or long irons). Specifically, the inner cover layer materials have a Shore D hardness of about 55 or greater, preferably about 55-70 and most preferably about 60-70. The flexural modulus of intermediate cover layer is at least about 50,000 psi, preferably about 50,000 psi to about 150,000 psi and most preferably about 75,000 psi to about 125,000 psi. In the preferred embodiment, the intermediate layer has a thickness of from about 0.1 inches to about 0.5 inches, more preferably between about 0.11 inches and about 0.12 inches, and most preferably between about 0.115 inches and about 0.119 inches. In another thin-layer embodiment, he thickness of the intermediate layer can range from about 0.020 inches to about 0.045 inches, preferably about 0.030 inches to about 0.040 inches and most preferably about 0.035 inches. Outer cover layer is formed preferably from a relatively soft thermoset material in order to replicate the soft feel and high spin play characteristics of a balata ball for “short game” shots. In particular, the outer cover layer should have Shore D hardness of less than 65 or from about 40 to about 64, preferably 40-60 and most preferably 40-50. Additionally, the materials of the outer cover layer must have a degree of abrasion resistance in order to be suitable for use as a golf ball cover. The outer cover layer of the present invention can comprise any suitable thermoset or thermoplastic material, preferably which is formed from a castable reactive liquid material. The preferred materials for the outer cover layer include, but are not limited to, thermoset urethanes and polyurethanes, thermoset urethane ionomers and thermoset urethane epoxies. 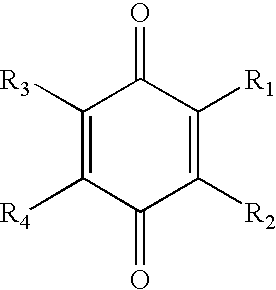 Examples of suitable polyurethane ionomers are disclosed in U.S. Pat. No. 5,692,974 entitled “Golf Ball Covers,” the disclosure of which is hereby incorporated by reference in its entirety in the present application. Thermoset polyurethanes and polyureas are preferred for the outer cover layers of the balls of the present invention. In accordance with another embodiment of the present invention, the golf ball comprises a relatively small, low compression, high COR inner core. The diameter of the inner core (or center) is preferably less than 1.40 inches or smaller, more preferably 0.8 inches to about 1.4 inches, and most preferably from about 1.3 inches to about 1.4 inches. The desired thickness of either the core (center) or intermediate layer can be selected in conjunction with the flexural modulus of the material of the layers and the desired overall compression of the ball and deformation of the ball. Most preferably, inner core is formed from a rubber composition containing a halogenated thiophenol compound. Such halogenated thiophenol compounds are fully disclosed in commonly owned and co-pending '963 and '448 patent applications, which have already incorporated by reference and discussed above. In accordance to one aspect of the second embodiment, the rubber compound preferably is a high cis- or trans- polybutadiene and has a viscosity of about 40 Mooney to about 60 Mooney. The core has a hardness of greater than about 70 on the Shore C scale, and preferably greater than 80 on the Shore C scale. The core also has a compression of less than about 60 PGA, and more preferably less than about 50 PGA. The resulting core exhibits a COR of at least about 0.790, and most preferably at least 0.800 at 125 ft/s. Other suitable polymers for inner core include a polyethylene copolymer, EPR, EPDM, a metallocene catalyzed polymer or any of the materials discussed above in connection with outer core discussed above, so long as the preferred compression, hardness and COR are met. Inner core may be encased by outer core layers comprising the same materials or different compositions than inner core. These outer core layers may be laminated together. Each of the laminate layers preferably has a thickness from about 0.001 inches to about 0.100 inches and more preferably from about 0.010 inches to about 0.050 inches. Preferably, the intermediate layer is made from a low deformation polymeric material, such as an ionomer, including low and high acid ionomer, any partially or fully neutralized ionomer or any thermoplastic or thermosetting polymer. The intermediate layer preferably has a flexural modulus of greater than 50,000 psi and more preferably greater than 75,000 psi. Among the preferred materials are hard, high flexural modulus ionomer resins and blends thereof. Additionally, other suitable mantle materials (as well as core and cover materials) are disclosed in U.S. Pat. No. 5,919,100 and international publications WO 00/23519 and WO 01/29129. These disclosures are incorporated by reference herein in their entireties. One particularly suitable material disclosed in WO 01/29129 is a melt processible composition comprising a highly-neutralized ethylene copolymer and one or more aliphatic, mono-functional organic acids having fewer than 36 carbon atoms of salts thereof, wherein greater than 90% of all the acid of the ethylene copolymer is neutralized. These ionomers are obtained by providing a cross metallic bond to polymers of monoolefin with at least one member selected from the group consisting of unsaturated mono- or di-carboxylic acids having 3 to 12 carbon atoms and esters thereof (the polymer contains 1 to 50% by weight of the unsaturated mono- or di-carboxylic acid and/or ester thereof). More particularly, such acid-containing ethylene copolymer ionomer component includes E/X/Y copolymers where E is ethylene, X is a softening comonomer such as acrylate or methacrylate present in 0-50 weight percent of the polymer (preferably 0-25 wt. %, most preferably 0-20 wt. %), and Y is acrylic or methacrylic acid present in 5-35 weight percent of the polymer (preferably at least about 16 wt. %, more preferably at least about 16-35 16 wt. %, most preferably at least about 16-20 16 wt. %), wherein the acid moiety is neutralized 1-90% (preferably at least 40%, most preferably at least about 60%) to form an ionomer by a cation such as lithium*, sodium*, potassium, magnesium*, calcium, barium, lead, tin, zinc* or aluminum (*=preferred), or a combination of such cations. Specific acid-containing ethylene copolymers include ethylene/acrylic acid, ethylene/methacrylic acid, ethylene/acrylic acid/n-butyl acrylate, ethylene/methacrylic acid/n-butyl acrylate, ethylene/methacrylic acid/iso-butyl acrylate, ethylene/acrylic acid/iso-butyl acrylate, ethylene/methacrylic acid/n-butyl methacrylate, ethylene/acrylic acid/methyl methacrylate, ethylene/acrylic acid/methyl acrylate, ethylene/methacrylic acid/methyl acrylate, ethylene/methacrylic acid/methyl methacrylate, and ethylene/acrylic acid/n-butyl methacrylate. Preferred acid containing ethylene copolymers include ethylene/methacrylic acid, ethylene/acrylic acid, ethylene/methacrylic acid/n-butyl acrylate, ethylene/acrylic acid/n-butyl acrylate, ethylene/methacrylic acid/methyl acrylate and ethylene/acrylic acid/methyl acrylate copolymers. The most preferred acid-containing ethylene copolymers are ethylene/methacrylic acid, ethylene/acrylic acid, ethylene/(meth)acrylic acid/n-butyl acrylate, ethylene/(meth)acrylic acid/ethyl acrylate, and ethylene/(meth)acrylic acid/methyl acrylate copolymers. The manner in which the ionomers are made is well known in the art as described in e.g., U.S. Pat. No. 3,262,272. Such ionomer resins are commercially available from DuPont under the tradename SURLYN® and from Exxon under the tradename IOTEK®. Some particularly suitable SURLYNS® include SURLYN® 8140 (Na) and SURLYN® 8546 (Li), which have a methacrylic acid content of about 19%. Other suitable mantle materials include the low deformation materials described above and any hard, high flexural modulus, resilient material that is compatible with the other materials of the golf ball. Examples of other suitable inner cover materials include thermoplastic or thermoset polyurethanes, thermoplastic or thermoset polyetheresters or polyetheramides, thermoplastic or thermoset polyester, a dynamically vulcanized elastomer, a functionalized styrenebutadiene elastomer, a metallocene polymer or blends thereof. Suitable thermoplastic polyetheresters include materials, which are commercially available from DuPont under the tradename HYTREL®. Suitable thermoplastic polyetheramides include materials, which are available from Elf-Atochem under the tradename PEBAX®. Other suitable materials for the inner cover layer include nylon and acrylonitrile-butadiene-styrene copolymer (ABS). Another suitable material for the intermediate layer is a high stiffness, highly neutralized ionomer having a durometer hardness of at least about 50 on the Shore D scale and a flexural modulus of at least 50,000 psi. The flexural modulus ranges from about 50,000 psi to about 150,000 psi. The hardness ranges from about 55 to about 80 Shore D, more preferably about 55 to about 70 Shore D. This ionomer, preferably at least two ionomers, may be blended with a lowly neutralized ionomers having an acid content of 5 to 25%, and may be blended with non-ionomeric polymers or compatilizers (e.g., glycidyl or maleic anhydride), so long as the preferred hardness and flexural modulus are satisfied. Examples of highly neutralized ionomers are disclosed in U.S. Pat. No. 6,756,436 which is incorporated herein by reference. In one preferred embodiment, this suitable material is a blend of a fatty acid salt highly neutralized polymer, such as a melt processible composition comprising a highly neutralized ethylene copolymer and one or more aliphatic, mono-functional organic acids having fewer than 36 carbon atoms of salts thereof, wherein greater than 90% of all the acid of the ethylene copolymer is neutralized, and a high stiffness partially neutralized ionomer, such as those commercially available as SURLYN® 8945, 7940, 8140 and 9120, among others. This blend has hardness in the range of about 65 to about 75 on the Shore D scale. The intermediate layer may also comprise a laminated layer, if desired. For example, the intermediate layer may comprise a laminate comprising four layers: a polyamide layer having a flexural modulus of about 200,000 psi, a terpolymer ionomer or un-neutralized acid terpolymer having a flexural modulus of about 30,000 psi, a low acid ionomer having a flexural modulus of about 60,000 psi and a high acid ionomer having a flexural modulus of about 70,000 psi. The composite flexural modulus of the four-layer laminate is about 90,000 psi or approximately the average of the flexural modulus of the four layers, assuming that the thickness of each layer is about the same. In a preferred embodiment, inner core, if present, has a diameter of about 0.800 to about 1.400 inches, more preferably about 1.3 to about 1.4 inches, a compression of about 44 or less, and a COR of about 0.800. The intermediate layer comprises at least two ionomers having a flexural modulus of about 50,000 psi or higher and has a thickness of at least about 0.110 inches, preferably between about 0.11 inches and about 0.12 inches. The cover is preferably a cast polyurethane or polyurea having a hardness of about 40 to about 60 Shore D. The core compression is preferably about 44 or less, and the combination of core and intermediate layer has a compression of from about 70 to about 100. The core preferably comprises a single solid layer. Alternatively, the core may comprise multiple layers. Preferably, its diameter is about 1.400 inches or less, more preferably between about 0.8 inches and about 1.4 inches, most preferably between about 1.3 inches and about 1.4 inches. The core has a COR of about 0.770 or greater, more preferably about 0.800 or greater, and most preferably about 0.820 or greater, so as to give the ball a COR of at least 0.800 and more preferably in the range of about 0.805 to about 0.820. In one preferred embodiment, the core has a COR of about 0.770 to about 0.810. In a preferred embodiment, intermediate cover layer and outer cover layer are similar to the inner cover layer and the outer cover layer of cover, respectively, for progressive performance. For example, outer cover layer is made from a soft, thermosetting polymer, such as cast polyurethane, and intermediate cover layer is made from a rigid ionomer or similar composition having hardness of at least 55 on the Shore D scale and flexural modulus of at least 55,000 psi. The total thickness the cover is preferably less than 0.125 inches. Innermost layer preferably is about 0.005 inches to about 0.100 inches thick, more preferably 0.010 inches to about 0.090 inches, and most preferably about 0.015 inches to about 0.070 inches. Intermediate cover layer preferably is about 0.010 inches to about 0.050 inches thick, and outer cover layer preferably is about 0.020 inches to about 0.040 inches thick. While any of the embodiments herein may have any known dimple number and pattern, a preferred number of dimples is 252 to 456, and more preferably is 330 to 392. The dimples may comprise any width, depth, and edge angle disclosed in the prior art and the patterns may comprises multitudes of dimples having different widths, depths and edge angles. The parting line configuration of said pattern may be either a straight line or a staggered wave parting line (SWPL). Most preferably the dimple number is 330, 332, or 392 and comprises 5 to 7 dimples sizes and the parting line is a SWPL. Golf balls made in accordance to the present invention and disclosed above have a compression of greater than about 60 PGA, more preferably greater than about 80 and even more preferably greater than about 90 PGA. These balls exhibit COR of at least 0.80 at 125 ft/s and more preferably at least 0.81 at 125 ft/s. These balls also exhibit COR of at least 0.75 at 160 ft/s and more preferably at least 0.76 at 160 ft/s. All patents and patent applications cited in the foregoing text are expressly incorporated herein by reference in their entirety. The invention described and claimed herein is not to be limited in scope by the specific embodiments herein disclosed, since these embodiments are intended as illustrations of several aspects of the invention. Any equivalent embodiments are intended to be within the scope of this invention. Indeed, various modifications of the invention in addition to those shown and described herein will become apparent to those skilled in the art from the foregoing description. Such modifications are also intended to fall within the scope of the appended claims. wherein the outer surface has a first hardness and the geometric center has a second hardness, the first hardness being substantially the same as or lower than the second hardness. 2. The golf ball of claim 1, wherein the core compression is 20 or less. 3. The golf ball of claim 1, wherein the second hardness is about 0 Shore C to about 5 Shore C higher than the first hardness. 4. The golf ball of claim 1, wherein the core has a maximum hardness value and the second hardness is less than about 10 Shore C from the maximum hardness value. 5. The golf ball of claim 4, wherein the second hardness is less than about 5 Shore C from the maximum hardness value. wherein the geometric center has a first hardness, the outer surface has a second hardness, and the core has a maximum hardness, the first hardness being substantially the same as or higher than the second hardness and is less than about 10 Shore C lower than the maximum hardness. 7. The golf ball of claim 6, wherein the first hardness is less than about 5 Shore C lower than the maximum hardness. 8. The golf ball of claim 6, wherein the second hardness is about 0 Shore C to about 10 Shore C lower than the first hardness. 9. The golf ball of claim 8, wherein the second hardness is about 0 Shore C to about 5 Shore C lower than the first hardness. 10. The golf ball of claim 6, wherein the core has a compression of 20 or less. 11. The golf ball of claim 10, wherein the core has a compression of 10 or less. wherein the core comprises a diene rubber composition, has an outer diameter of 1.18 inches to 1.40 inches, a compression of 30 or less, and a coefficient of restitution of 0.750 to 0.790 when measured at an incoming velocity of 125 ft/s, and wherein the golf ball has a compression of 75 to 110 and a coefficient of restitution of 0.810 or greater when measured at an incoming velocity of 125 ft/s. 14. The golf ball of claim 13, wherein the core has a diameter of 1.2 inches to 1.36 inches and a compression of 20 or less. 15. The golf ball of claim 14, wherein the core compression is 10 or less. 16. The golf ball of claim 13, wherein the core has a maximum hardness and the second hardness is less than about 5 Shore C lower than the maximum hardness. 17. The golf ball of claim 13, wherein the second hardness is about 0 Shore C to about 10 Shore C lower than the first hardness. 18. The golf ball of claim 17, wherein the second hardness is about 0 Shore C to about 5 Shore C lower than the first hardness. 19. The golf ball of claim 13, wherein the cover has a hardness of 70 Shore D or less. 20. The golf ball of claim 13, wherein the cover thickness is 0.14 inches to 0.16 inches.